Sometimes you forget just how good live music can sound. Crisp horns, whispering strings, and even clanking watering cans. When about halfway though Fanfarlo's set, you have a "Wow!" moment. And you look around the Doug Fir to the rest of the 20 and 30-somethings tapping along, smiling blissfully. They're thinking exactly the same thing. On Fanfarlo's first jaunt to PDX, they got their van broken into but that didn't subdue their set. Rather, they took the stage as a trio with a mandolin, guitar and drums to gently strum into the calming darkness. Then the white Xmas lights were flipped and the band became six, complete with sleek harmonization and a lone horner on "I'm A Pilot." Percussionist Amos Memon delicately generated rolling thunder on the cymbals with his white-tipped mallets while multi-instrumentalist Cathy Lucas twanged a hand saw along with her performance of lullaby oooh-ooooh vocals and on the violin, guitar, and keys. With a foot stomping, a cappella opening to "The Walls Are Coming Down," Fanfarlo produced a tight, precise sound that was perfumed by the whiskey drifting from my neighbor's plastic Dixie cup. Trumpeter Leon Beckenham also picked up the world's smallest, red tambourine while co-lead singer Simon Balthazar snatched as many instruments as he could including a clarinet towards the end of the set. The London sextet appeared very prim and proper, more like proper-hip, onstage building up to a super-synthy rendition of "Luna" with a calming interlude where Beckenham swapped his horn for a melodica to close the night. New York's Freelance Whales opened the night with Jónsi-style bowing of the guitar strings and xylophone chimes. Banjos strummed. Electro-inclined synths chirruped. 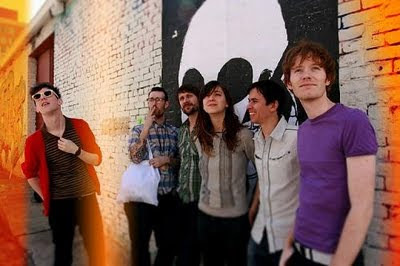 And all five members blended vocals into indubitable, indie pop. Foggy echoes of drawn out moans and aaaahhs floated around portable harmonium pumps and the bow was employed on something that looked like a cross between a birdcage-hamster wheel-giant whisk, but turned out to be a waterphone. Obviously. Freelance Whales even beat a tin watering can in a "Do-Re-Mi"-esque jam leaving behind a serene, familial vibe.